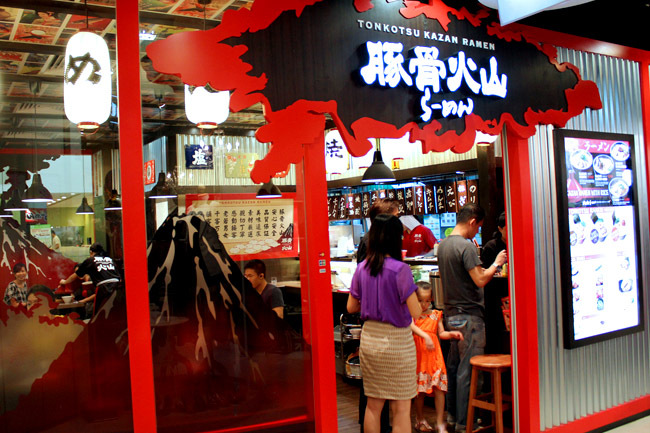 Tonkotsu Kazan Ramen at Novena Square 2 is known for its Volcano Ramen, and you may be wondering if its pork broth erupts and spills to the face. Not really. Simply put, this Osaka-based shop uses a cone-shaped lip with a cylinder top to cover their noodles, and steam comes out during the cooking process just like an erupting volcano. Sodesu ne. 1. 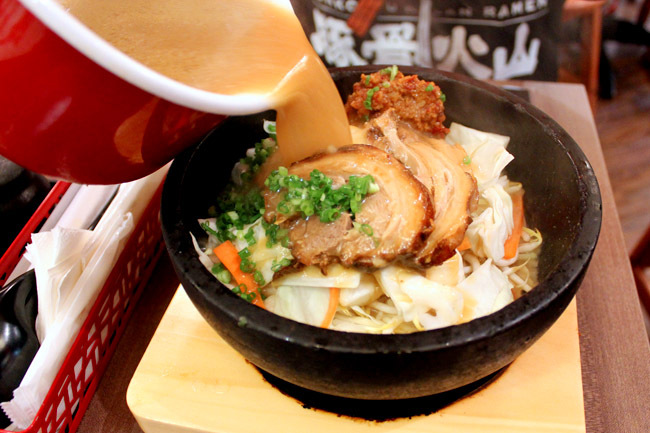 Soup is poured into a preheated 300 degree Celsius stone bowl with all the ingredients inside. Warning: HOT!! 3. You can continue to put the rest of the soup in. Mix the ingredients and noodles well. 4. 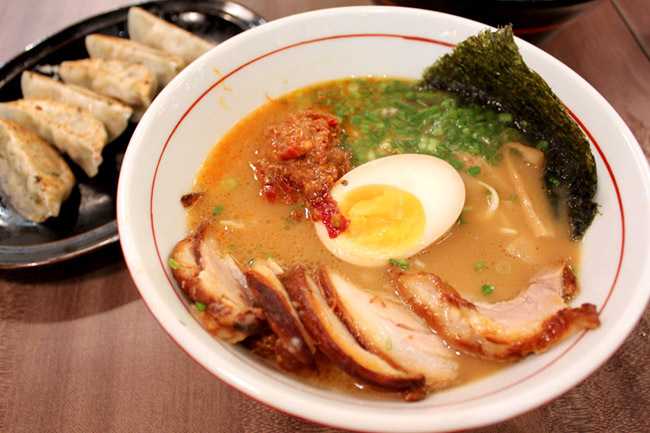 Transfer the ramen to a smaller bowl to enjoy. I was supposed to add rice into the left-over soup mixture, but the waitress obviously left out my rice! 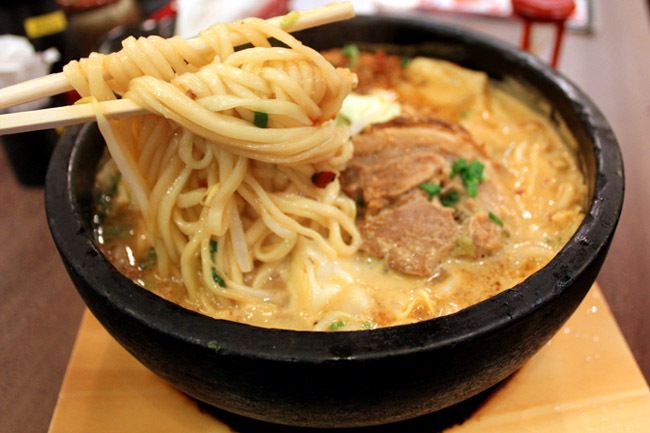 If you are the sort that loves your broth thick, thick and thick, yet not overly salty, this pork bone soup prepared everyday early morning should be to your liking. Veggie lovers should be glad to know that there is A LOT of vegetables like cabbage, carrots, leeks and bean sprouts added. On the flipside, the noodles were slightly thick for my liking. It did not help that the chewy strands got slightly soggy as I struggled to finish the big bowl. I seriously think that this can feed two persons. Fortunately (or unfortunately), I am the kind who does not like to waste food. 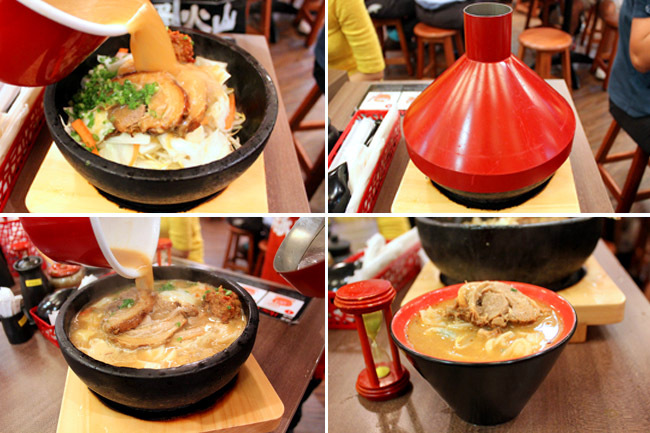 Tonkotsu Kazan Ramen also sells the usual Shoyu, Shio and Karamiso Ramen ($12.00) – the last bowl of tonkotsu broth enhanced with special blended spicy miso paste being my favourite. While this small shop may seem rather gimmicky, they actually serve quite decent stuff. Are you coming back soooooon?